Hi loves! Another fun review today, this time featuring the Bundle Monster Occassions Spring Time Stamping Set and the impressive Bundle Monster Mochi Stamping Station! I have to admit, when I received the e-mail about the Mochi Stamping Station, I was a bit scared of it - I've never seen a stamper this huge! First, let's talk a bit about the Mochi Stamping Station. This is a huge stamper that can be used in various ways. If you have those larger buffet-style stamping plates, you can pick up the full plate and stamp multiple nails in one go. But it also works as a base to create stamping decals for example! It measures about 12 cm x 5 cm and the pink stamping pad can easily be removed from the holder. I tried it without any priming and while it did pick up, it wasn't consistent. After priming half of it using a magic eraser and taking of the dust using a lint roller, it worked better. This stamper does have a learning curve. First off all the amount of polish you need to cover the stamping polish is different than when you'd stamp one nail, and you have to focus more on the scraping. Also, because the stamper is slightly sticky, you'll have to hold down the plate while rolling over the stamper to pick up an image. 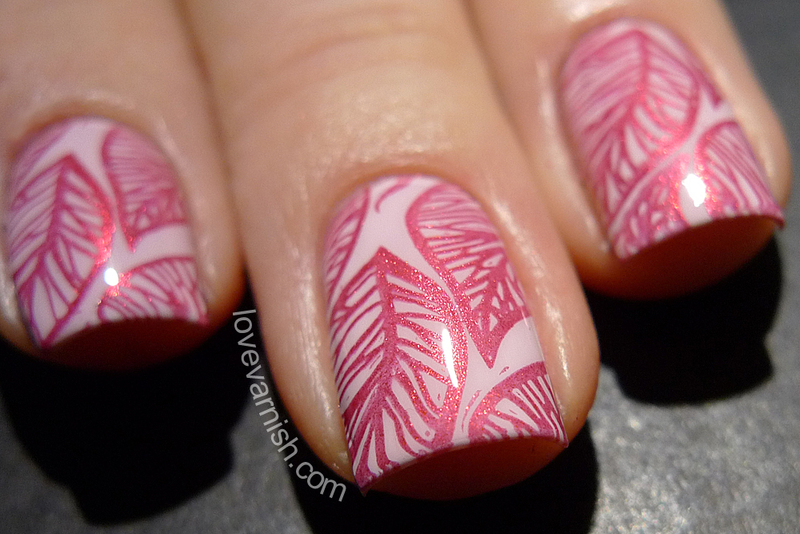 After picking up the image, just lay down the stamper on it's back and push down your nails one at a time! The first look below was done using this Mochi Stamping Station and as you can see, it worked quite well! 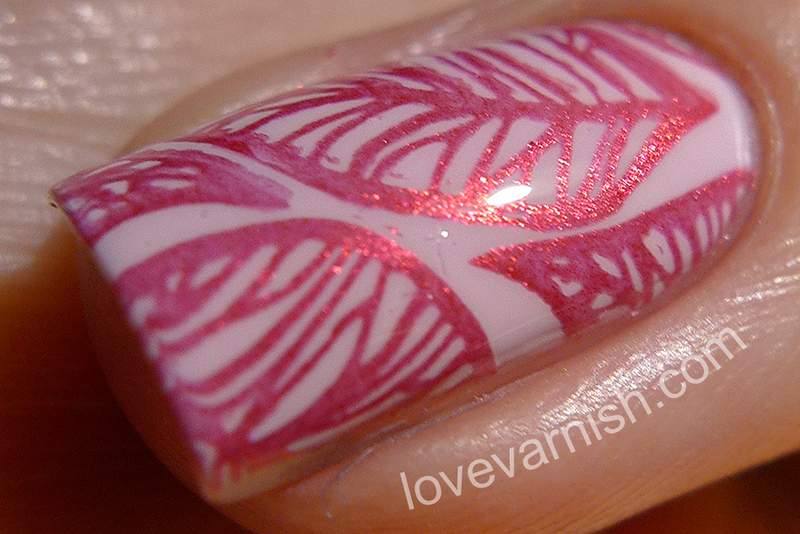 If you want to see this stamper in action, check out this awesome video by Very Emily! The Bundle Monster Occassions Spring Time Stamping Set consists of 10 plates with various Valentine's, Chinese New Year and Spring designs and provides you with endless options of nail art! As always the etching is great, the plates are square and there's a nice balance between buffet-style plates and plates with single images. Bundle Monster S221 is a plate full of lovely words (pun intended ♥) in various languages. My base is a sponged mixture of China Glaze Something Sweet, Dance Legend Polina and OPI Kiss Me On My Tulips, after that I stamped using a black polish and the Mochi Stamping Station. Bundle Monster S226 has floral designs and I chose a leafy design for this look. My base is (again) China Glaze Something Sweet and the stamping color is H&M Lady Luck which is actually a metallic red but turned hot pink over the soft pink base :-D.
Bundle Monster S228 has 6 Chinese New Year designs and I went with this lovely geometric design. My base is the beautiful Glam Polish Big Girls Need Big Diamonds (so sparkly!) and I stamped using a black stamping polish. Isn't the way the sparkles peeks behind the stamping image just amazing? The Mochi Stamping Station is a great new toy, and while I don't think I've unlocked the full possibilities already, it's great to have in my stash and I'll definitely use it more often in the future! It does take some getting used to but if you like stamping and are looking for a way to speed up to process, I recommend this one. The Occasions Spring Time Stamping Set is a fun set that has images for many occasions and the quality is great as I've come to expect from Bundle Monster. 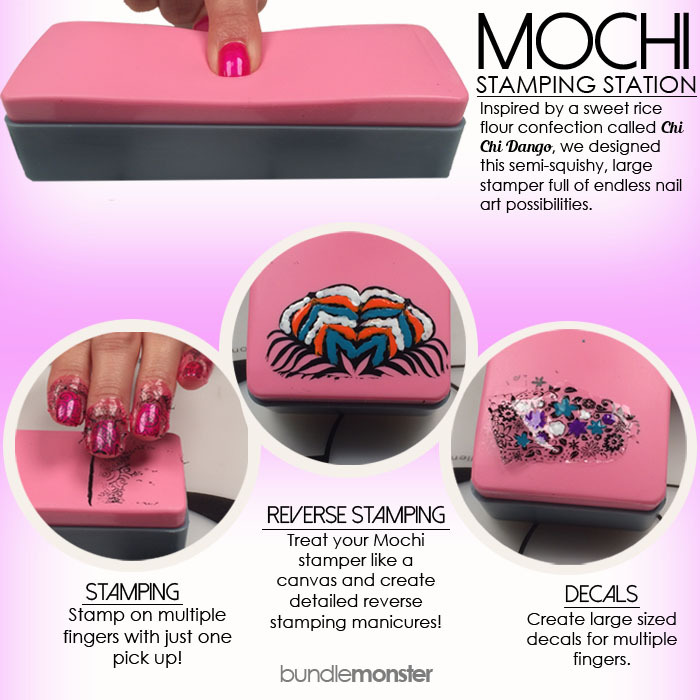 What do you think of the Mochi Stamping Station? Will you be giving it a go? Tell me in the comments! Bundle Monster is a company located in Hawaii and sells various nail art items, along with gel polish and regular polish. They ship worldwide! The Mochi Stamping Station releases February 4th and the Occasions Spring Time Stamping Set is available for purchase already.